The Flash 8 is an accelerator cartridge for the C64, which is connected at the expansion port. The flash 8 cartridge uses the 65c816 CPU with 16 bit and runs at 8 MHz (or 1 MHz switchable using software with the right DIP switch setting). It could have up to 1 MByte of ZIP memory. This CPU is compatible with the MOS 6510. The Flash 8 cartridge was sold by the German company Roßmöller and later by the company Discount 2000. The Flash 8 was available in two versions: with 256K and 1MB RAM, where the RAM chips were so-called ZIP RAMs. CMD's 1750XL REU used similar RAM chips. These chips are very fast and can easily address eight bits at once, but they are also expensive. The RAMCard of the later released SuperCPU however used more common SIMMs, but actually slowed down the CPU during random non-sequential accesses. The memory could be linearly addressed directly by the 65816 however, which offered much bigger possibilities of its use than the Commodore RAM Expansion Unit. A minor limitation was that the first 64K replaced the RAM of the C64. Thus, the 256K version offered only 192K "extra" RAM. This resulted in some programs being incompatible with the 256K RAM expansion of the Flash 8 when a full 256K was expected but not actually present on the device. While Creative Micro Designs (CMD) was more of a typical hardware maker, Roßmöller was quite open to the C64 games and demo scene. They understood very well that the Flash 8 would have a chance to establish itself with the users if it leveraged game developers and the demo scene. On the advice of the Airwolf group, Roßmöller drove to Sweden in 1994 to the scene party called "Tribute '94" to present the new hardware there. Unfortunately, the event, which was announced by the groups Avantgarde and Genesis Project as one of the biggest scene meetings of all time — with over 1,000 guests according to the invitation text — was very poorly attended. Although some standard C64 [demo]s were shown and the acceleration was impressive, the larger scheduled demos (such as a movie clip) were not completed in time. The game developer Stefan Gutsch, one of the founders of Protovision, started developing the shoot'em ups Metal Dust exclusively for the Flash 8. Later it was adapted for the SuperCPU and eventually Flash 8 support was dropped. That said, the game will run more or less as expected with Flash 8 hardware except for the game's final boss. The Flash 8 appeared in a time in which the C64 community regarding extending the capabilities of the C64 with ambivalence. Some individuals took a "purist" stance, namely that the C64 with a Floppy drive and an Action Replay cartridge was as much expansion as the system realistically required. This was very much a reaction to the "upgrade mania" culture in the PC market of the mid-1990s. At the time, PCs developed so fast that almost every year a new PC had to be purchased to keep pace with the advancement of technology. Others saw in the Flash 8 the possibility of realizing otherwise unfeasible games, demos, and application software on what was now, essentially, a 16-bit C64. The scene group Airwolf-Team had a Flash 8 column especially in their diskette magazine Metal Force (see links) to increase the support of the expansion by the scene. The Flash 8 unfortunately had some serious problems that prevented greater acceptance among the C64 user base. ThunderBlade and Mr. Lee from the Airwolf team tried to work with Discount 2000 to eliminate the bugs and make the expansion card much more attractive. Unfortunately, they were rejected by Martin Roßmöller with the statement: "The card is ready, enough!". Certain memory areas were inaccessible to VIC while operating the Flash 8, causing some games to display only heavily corrupted screens. For performance reasons, Zeropage and Stack have also not been made accessible to the VIC, in the mistaken belief that graphics data would never be there. The SuperCPU solved this later with its own optimization modes baked into the device's FPGA. In 1 MHz mode, inter-chip Timing was not 100% identical to the C64. So, some demo effects such as IFLI did not work properly. The Flash 8 had to be manually adjusted with a potentiometer to the timing of each specific C64 host. The older the C64 model the more difficult it was to achieve expected operation and compatibility. Some very early systems proved to be completely incompatible with the Flash 8. Pressing the Reset button filled the entire memory with garbage. After testing a program, you could not simply exit via reset and restart your assembler making programming on the device unnecessarily cumbersome. It was possible to switch to 1 MHz mode live using the DIP switch. But this setup was uncomfortable in contrast to the simple toggle switch of the SuperCPU. 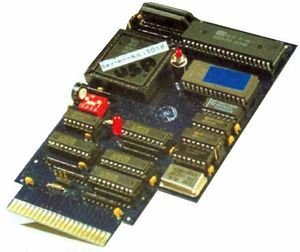 Because the Flash 8 populated the cartridge port it could not be used with common disk I/O accelerator cartridges. This was later circumvented by using JiffyDOS in an EPROM on the Flash 8. But this usage was not sanctioned by CMD and could result in a licensing issue. In addition to the controversy described above, these problems prevented the spread of the Flash 8 massively. Added to this was the price: C64 hardware was now almost used as a gift or hand-me-down. In comparison to the cheap or "free" cost of the system, the Flash 8 was considered very expensive. From the point of view of consumers money spent on the Flash 8 might be better allocated as savings toward an Amiga or a PC. New machine language commands had to be added to accommodate additional RAM and 16-bit CPU registers and new or advanced development tools needed to be produced. From Roßmöller came however only a very user-unfriendly, rudimentary Assembler, which should be able to address the features of the 65816 via some macros. In practice, this was not workable. Only when the Assassin was developed on the basis of the vis-ace or AssBlaster by Mr. Lee / Airwolf-Team, software could also be written directly for the Flash 8. A Flash 8/65816 Machine Language Monitor was also released by the programmer Dr. Zoom. This page was last modified on 13 February 2018, at 15:54.